​The Lopi Wood Burning Stoves | Lopi 1750 | Stove will heat your home even during power outages. The 1750 also gives you a great cooking surface for food. 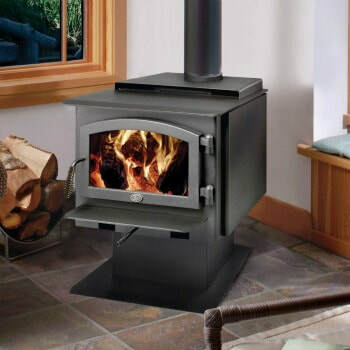 This 1750 stove can heat up to 2,000 sq. ft. Lopi’s reputation is built on heating efficiency, dependable performance and excellent artisanship. With affordability in mind, the 1750 is a no-nonsense heater, which is ideal for heating mid-size homes and spaces within the household. Plus you never have to worry about losing heat in a power outage again! The stove’s radiant cooktop surface allows the stove to function as a stove top as well. This is great for making warm drinks or tasty dishes! If the project is outside of Southwest Montana please visit the Lopi site for dealers that may be near your area. Bare's may only sell these products bought and picked up from our store location. Please understand we are unable to ship, sell, deliver, install, service or provide warranty for items outside of our area.